January, 2017 | Fresh Air, L.P.
We talk about maintenance a lot. Typically, it’s in regards to your air conditioning system, considering we use our air conditioners for the majority of the year in this part of the country. However, as our temperatures finally begin to cool down, it’s time to think about the other half of your HVAC system—your Houston, TX heating unit. When is the last time you had it maintained? If that answer doesn’t fall within the past year, then the time to schedule a tune-up is now! You can think of maintenance like a tune-up for your heater—our trained technicians will thoroughly examine the system, checking the burners for proper operation, cleaning any dust or build-up, and making any adjustments deemed necessary in the process. It’s also at this time that we’ll make any recommendations for repairs. Addressing these repair needs right away ensures your system will last as long as possible. Is now really the time, though? With temperatures still relatively mild here compared to other parts of the country, it may be hard to imagine how many people are using their heaters on a regular basis right now. Although, when temperatures are as high as they are during the majority of our summers, anything below 50 degrees at night could seem pretty chilly! So perhaps you are one of those homeowners who has decided to switch their heat pump over to heating mode to begin using for warmth. But what if it won’t switch to heating mode? What should you do then? Air Conditioner Installation: Size Matters! While many other parts of the country brace for winter, we’re finally cooling down from summer, making now the perfect time to shop for an air conditioner. When you’re in the market for a new AC system, it’s understandable that your first instinct may be to choose a new system with the best deal or lowest price. While this might work for many of the smaller appliances in your home, choosing an air conditioner without confiding in a professional can actually cost you. 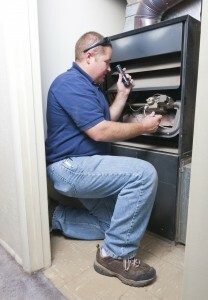 AC systems that aren’t properly sized by a professional can run into major issues. The cooling capacity of an air conditioner is measured in BTUs (British Thermal Units) and AC technicians such as the professionals on our staff measure your home using many different factors to determine the correct BTUs needed for air conditioning installation. Posted in Air Conditioning | Comments Off on Air Conditioner Installation: Size Matters! With temperatures still hovering in the high 70s and even 80s, we are still using our air conditioners on a fairly consistent basis. As such, hopefully you’ve found yours is working satisfactorily. One of the most common service calls we get is in regards to refilling refrigerant in AC systems. We want to set the record straight—your refrigerant should not need refilling! Your HVAC system is supplied—charged—with enough refrigerant to last its entire service life. Therefore if you are losing refrigerant, what is actually happening is that you have a leak. Refrigerant is not like fuel—you can’t burn through it. Rather, it is recycled. Recharging your refrigerant is sometimes necessary, but doing so without resolving the source of the leak will get you nowhere fast.